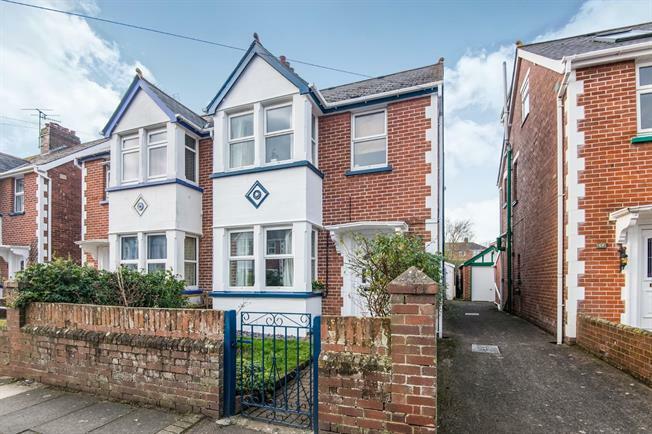 4 Bedroom Semi Detached House For Sale in Exeter for Asking Price £330,000. Accommodation to the ground floor consists of an open plan living comprising a dining room, living room and kitchen. As well as this the property benefits from an alternative sitting room, sun room and utility room. To the first floor you will find three bedrooms, two of which are very generous doubles and a family bathroom. The second floor provides a master bedroom that over looks the beautiful rear garden. To the side of the property you will find a shared driveway which leads to a private single garage and an enclosed rear garden which is mostly laid to lawn. Other benefits to the property include UPVC double glazing and gas central heating through out. A cosy sitting room comprising UPVC double glazed bay window to the front aspect, carpeted flooring, working open fire with wooden mantel, radiator. A light and spacious dining room with direct access onto the kitchen and living room which provides an open plan living space. Carpeted flooring, fireplace with gas connection available. A well presented handmade Winkleigh Pine kitchen comprising a range of base units. Wooden flooring. Two UPVC double glazed windows to the side aspect. Space for freestanding oven with extractor hood over, larder style fridge freezer and dishwasher. Ceramic sink with mixer taps over. UPVC double glazed door to the rear aspect and UPVC obscure double glazed window to the rear aspect. Vanity style hand wash basin, low level WC. Wall mounted gas combination boiler. Space and plumbing for washing machine and tumble drier. Wood effect laminate flooring. There is also plumbing in place for a shower to be reinstated if required. UPVC double glazed window to the front and side aspects over looking garden. Sliding doors providing direct access to rear garden. UPVC obscure double glazed window to the side aspect, tiled surround. White three piece suite comprising bath with electric shower over, low level WC and vanity style hand wash basin. Tiled flooring, radiator. UPVC double glazed window to the rear aspect, carpeted flooring, radiator. Vanity style hand wash basin, built in storage. UPVC double glazed bay window to the front aspect, carpeted flooring, radiator. UPVC double glazed window to the rear aspect over looking the garden, carpeted flooring, radiator. Shower cubicle containing electric shower. To the rear of the property you will find a large garden which is mostly laid to lawn. The property is fully enclosed by fencing and mature hedging. The garden also benefits from an area suitable for a children's play area, storage shed and would be the perfect area for alfresco dining during the summer months. To the side of the property you will find a single garage which is accessed via an up and over door.